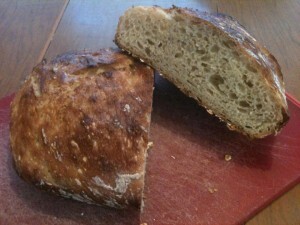 This recipe is for REAL Sour Dough bread that is fermented/cultured and uses no comercial yeast. It can be eaten by people with wheat sensitivities, allergies and even people with Celiac Disease without provoking any reaction whatsoever. Find the full picture tutorial on Dr. Dana’s Facebook page. Mix well with a whisk. It will look bubbly and frothy! 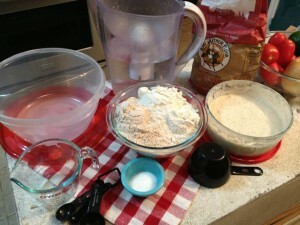 Mix well – you will still be able to use the whisk as the dough is still quite soft. 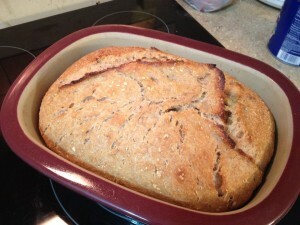 Mix well – you’ll have to use a large spoon now since your dough will now be quite stiff. 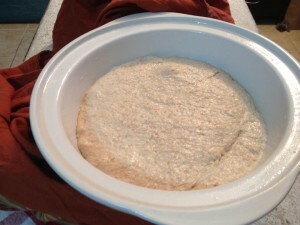 Now you have a nice glob of Magic Bread dough ready for its first rise. Cover it with a tea towel or plastic wrap and set aside for about 12 hours until it is about doubled in size and you can see bubbles start to form on top. ***Tip – at any point if your timing is off and you know you won’t be around at the right baking time, you can put your dough in the fridge and it will stop the rising process. When you get back and can get the timing right, just take it out and let it finish rising. Cold slows the multiplication of the yeast – just like when you keep your starter in the fridge instead of on the counter. 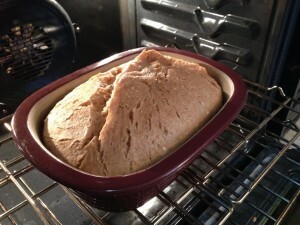 After the first rise – see the little bubbles on the top. You want to see bubbles but you don’t want them to be popping. 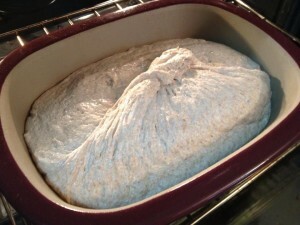 If the bubbles start bursting your dough will start to slowly deflate . This is a big sign to move onto the next phase. Sprinkle some flour on the top of your dough. Flour up your hand and start to scoop around all the sides of the bowl. 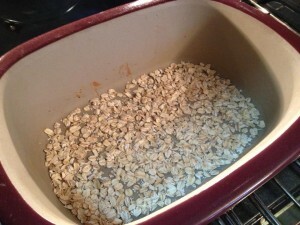 You will need to flour up your hand after each “Scoop.) Your dough will be sticky. 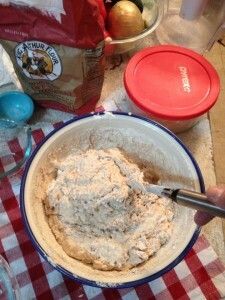 Keep scooping until you have floured your dough and it isn’t sticking (too much) to the sides and bottom anymore. 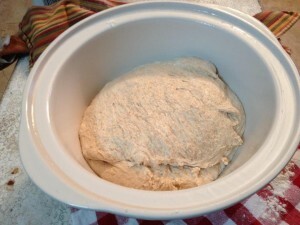 Transfer the dough now to a separate, clean and OILED bowl for the second rise. Cover with a tea towel and let rise about 5 more hours until doubled in volume and bubbly again. If your kitchen is really warm (or its summer time) it might rise faster and if its really cold in the kitchen it might take a little longer. 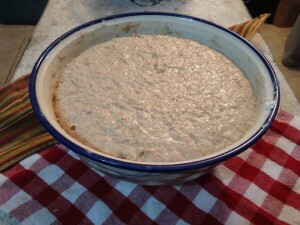 After the second rise it will be bulked up and bubbly again. Preheat your oven to 425° – while its heating up place a covered stoneware or other similar baking pan in the oven for 30 minutes. 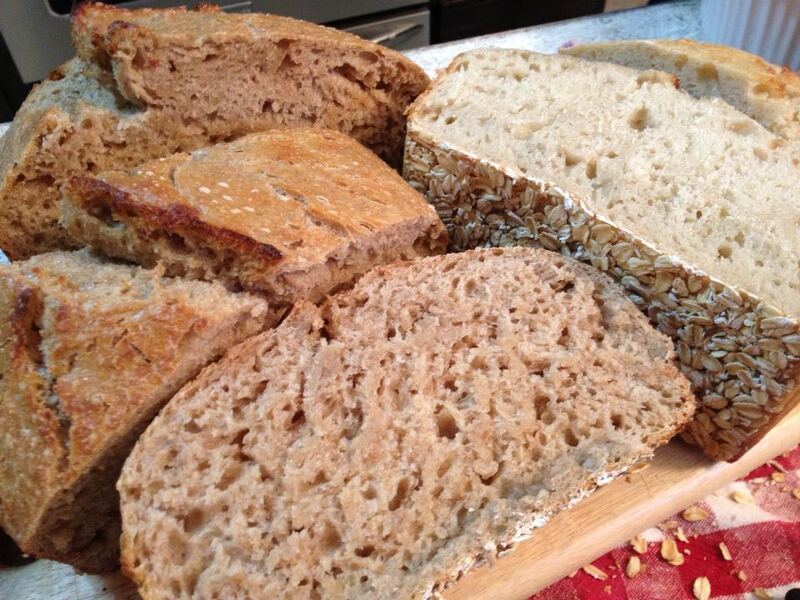 You want the baker to be super hot when you pour your dough in. Cover it back up and bake it COVERED for 30 minutes. This is what is should look like after the first 30 minutes. Now it’s ready! The top is nice and golden!